Seniors are staying active, healthy and independent longer today and exercise is the key. Any kind of regular activity, from sprinting and tae kwon do to gardening and walking will help today’s seniors stay in their homes and age in place the way they overwhelmingly prefer. If your loved one isn’t quite earning a black belt, but wants to kick tush and take names in her own way, companion home care can be the solution. Here are three seniors who are in the news for some heroic feats this week. Suzanne Louden, 77, started taking tae kwon do lessons five years ago after spotting a flyer offering a free lesson. Today, she trains five days a week, for at least an hour a day, alongside teens and pre-teens at her dojo in Colorado Springs. Petite Suzanne is the oldest student, but her son Thomas knows better than to sneak up on her, especially when surprising her by flying in from North Carolina to watch her earn her black belt on October 18th. She believes the movement keeps her young, and plans to keep practicing until she can’t stand up any more. Best of all? She’s inspired her two young granddaughters to take up taekwondo as well. 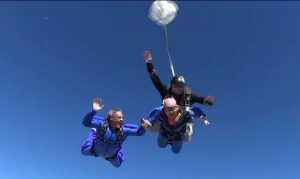 Vernon Maynard took his first skydive in 2013 on his 100th birthday, and he crossed a big item off his bucket list. On November 4th, he did it again with a big crowd of family and friends waiting for him on the ground. His niece, nephew and grand-niece joined him in the skydive this year. The big occasion? His 101st birthday! It’s even likely that his jump set a Guinness World Record for world’s oldest skydiver, although retired car dealer and former small plane pilot Vernon was most excited about the view. No word from Vernon about his plans for next year’s birthday celebration. You can watch the video of Vernon’s skydive here: http://youtu.be/7F4s9Hmo980. At age 99, Ida Keeling set a record in the 100m dash this past August at the Gay Games held in Cleveland. Although she was the only competitor in the 95 – 99 year old age group, she had her eye on the prize. The New York City great-great-grandma ran 100m in 59.80 seconds, and though she came in last, she still set an international record. Ida began running at age 67 at the suggestion of her daughter, a lawyer, businesswoman and track coach, after Ida lost her two sons to drug-related shootings. Ida’s first race was a 5K, and once the endorphins kicked in, she never looked back. Running makes her feel stronger and happier, and of course, the exercise keeps her healthy. Ida still lives independently, uses her building’s gym twice a week, does yoga, and runs in her building’s hallways. Next year, in 2015, she’ll have the opportunity to set a record for the 100 – 104 year old age group. She’s looking forward to that.